First of all, thank you very much for the contributions for meals for the homeless. I have collected more than what I required. I spent about RM280. 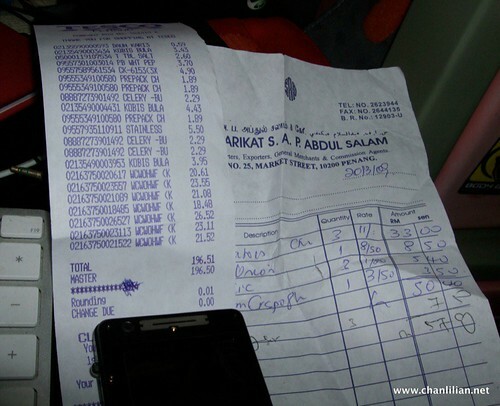 Two receipts for the purchase of chicken, vegetables and spices are shown above. I also bought some soya sauce and soya bean pastes from a sundry shop. That’s how I rounded up the figure to RM280. Some of the items like eggs, oil, rice and cooking gas were also donated and not included in the RM280. I collected : USD108 which I have cashed out at 3.54. I have RM508 in hands now. I will either use the money for another cooking project or I will donate it to The Lighthouse which is a drop-in centre for the homeless. The Lighthouse provides meals for the homeless every day during the week. The above video is not related to my cooking project but it is a documentary we are trying to produce to highlight the plight of the homeless. I hope the video helps to give others a glimpse of what it is like sleeping on the street. Thanks to everyone for the contributions. Please trust me that the extra money collected will be used for the same purpose – giving meals to the homeless. If you wish to see what we cooked, you can find some photos on my personal blog here on our cooking project. Tq tq for the donated money! my contribution to your blog helps people.. now feel like doing charity while reading your blog.. thanks again.